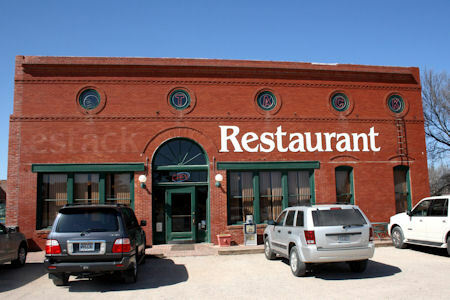 The Smokestack Restaurant has been in Thurber, Texas right on Interstate 20 for many many years. I've zoomed past it lots of times, but I was always in a hurry to get somewhere and never stopped. In the 1960's I was always with my family headed to Dallas / Fort Worth area going to Six Flags or to the State Fair. In the 1970's I headed to Denton going to college and in the 1990's I was taking my children to Six Flags and the State Fair. I never stopped, always wanted to but never did. Times have changed the next time I'm racing by Thurber, Texas, I'm stopping! 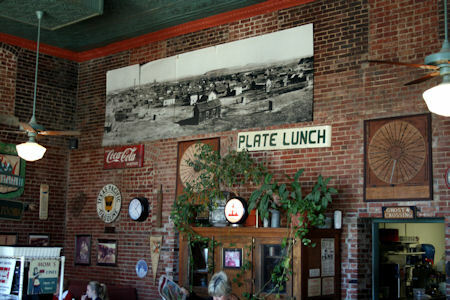 In 2010 I had the opportunity to eat at the Smokestack. The menu is more extensive than I expected. There was also a good crowd for lunch. My perception was that the clientele were mostly locals. So with a population of just 5 how is that possible? OK, most of the people eating there that day looked like regulars that most likely lived in the immediate 30 mile radius. (This is West Texas) The only reason I even mention this is because when locals eat there, it is usually a good sign. 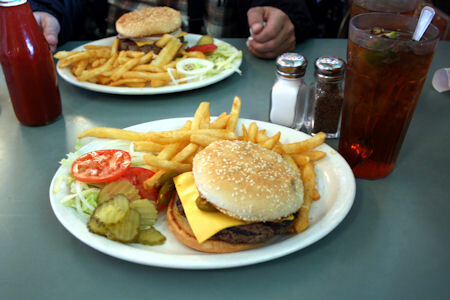 Because of the extensive menu I ordered what I almost always order a Jalapeño Cheese Burger. It was good, the fries were OK The jalapeños were hot. and the service was good. One thing though, I don't remember ever seeing a wine list on the same menu in which you could order a Jalapeño Cheeseburger. So I asked my server which wine she recommended to have with a Jalapeño Cheeseburger. After a moment of thought and with her best West Texas accent (which I really like) she said, "I would recommend red or white." "I think I'll stick with a Dr Pepper," I replied.